Rachel Morgan has fought and hunted vampires, werewolves, banshees, demons, and other supernatural dangers as both witch and bounty hunter—and lived to tell the tale. But she's never faced off against her own kind . . . until now. Denounced and shunned for dealing with demons and black magic, her best hope is life imprisonment—at worst, a forced lobotomy and genetic slavery. Only her enemies are strong enough to help her win her freedom, but trust comes hard when it hinges on the unscrupulous tycoon Trent Kalamack, the demon Algaliarept, and an ex-boyfriend turned thief. It takes a witch to catch a witch, but survival bears a heavy price. Black Magic Sanction is the eighth adventure of witch Rachel Morgan and it is an urban fantasy tour de force. White Witch, Black Curse (book #7) left Rachel with her back against the wall and at an all-time low point in her life. Shunned by her own community, Rachel's only option is to find a way to get the Coven Council to repeal their decision using any means and any resource at her disposal, which as always leads to even more trouble. Black Magic Sanction is packed with edge-of-your-seat action, tension, mystery sorrow and joy and the majority of the long standing characters take an active part in either helping or hindering Rachel's efforts. Individual motivations are sometimes clear but often gray adding wonderful complexity and drama to the story. The author continues to explore and re-define the relationships Rachel has with other major characters. Trent and Rachel have a complex history and Black Magic Sanction delves into that further, both through flashbacks and in the present. I particularly liked this remembrance of Rachel riding with Trent when they were kids at camp. Tulpa's feet left the earth, and he stretched forward. One with him, we leaned as well, instinct older than magic taking hold. The beating of his hooves was silenced, and the thumping of my heart was all that there was. For an instant, we flew. Tulpa's front feet touched, and the world rushed back. The cadence of his hooves beat into me, and I shouted, letting go of Trent. It had been marvelous. Wonderful beyond belief. Exuberant, I smiled, feeling breathless and powerful all at the same time. Trent turned, wonder in his eyes, shock almost. "You held on." "They drugged me," I said, trying to smack his reaching arm away only to find myself picked up and plopped on the table, sitting on some of Ivy's papers. "In my leg," I continued, as he smelled my breath and peered over his smoked glasses at me. "Shot me twice. I want my name, or I'm going to start charging you a fee every time I field something for you. And it's going to be expensive. I'm Park Place. Buddy." His red, goat-slitted eyes squinted at me from over his smoked glasses. "You're more like Oriental Avenue right now, dove. What are you on?" Pierce was silent until he stopped right before me, his face showing"' unreadable emotion. "You're firm in will, pure in intent, strong in magic. But now it's tempered with wisdom, and you're more beautiful and brilliant yet." I went to turn away, and he pulled me back. "You are shades of gray swirling, balancing needs and desires," he added, watching me, "You are good, Rachel. No matter what your choices lead you to, you will remain such." Readers should also prepare themselves for another emotionally wrenching character loss leading to one of the most devastatingly powerful moments and expressions of loss in the series to date. For those that cannot abide spoilers I have rendered the following quote in white text (just highlight it if you want to view). "Tears could not be equal, if I wept diamonds from the skies," Jenks whispered, empty and bereft. "My word silent, though I should howl. Muffled by death, my wings can't lift me high enough to find you. I feel you within. Unaware of my pain. Not knowing why I mourn." He lifted his eyes to mine, a glimmer of tears showing. "And why I breathe alone." I shifted my bare feet, cold on the earth. I wasn't a poet. I had no words. Tears blurred my sight as we stood and watched his life burn. 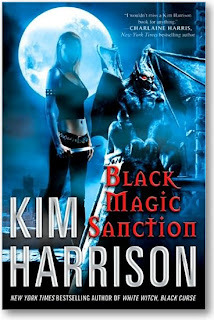 Black Magic Sanction as expected, is one of the best reads you will find in urban fantasy this year. The world of the Hollows continues to enrich and fascinate and there couldn't be any more exciting guide than Rachel Morgan and company. 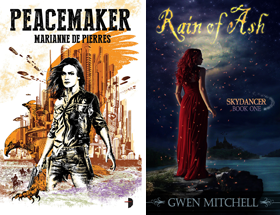 The conclusion brings a new balance to their lives and the events of the novel introduce a whole new world of possibilites for Rachel Morgan #9. Last year, Barnes and Noble named the first book in the series, Dead Witch Walking, the best urban fantasy of the past decade. Black Magic Sanction lives up to that standard. If you would like to a chance to read Black Magic Sanction, I have two copies to giveaway. The contest ends March 1 at midnight. Details here. Read an excerpt of the first seven chapters. I sort of read this review with one eye open because I'm still waiting for my copy in the mail. Great review, really looking forward to this one. Doug that was really clever with the hidden text. I am now actually afraid to read this. I mean really, hmmm. I am 99% sure I am going to be able to attend a signing next month, keeping my fingers crossed. I am going to wait to read until then. Thanks for the review. I love KH. I have to say that am very happy to read the review of Black Magic Sanction, Rachel Morgan and company are very near and dear to my heart in my reading pleasure and am quite looking forward to getting my copy in the near future. Thanks for the nice excerpts and also I know that it is hurtful for a major character to end in this series but if everyone has truly been paying attention we have been seeing the writing on the wall for the last several books. I also really enjoyed the short video with Kim Harrison about the series. Thanks Doug, job well done! Hi Doug - I love how you are such an enthusiastic supporter of this series. Thanks for the hidden text option - I did not peek, although I have a pretty good idea who it'll be. BTW, did you know that the first book in the series is a freebie on Kindle right now? That's an amazing deal, to get the best UF around for free. Danielle I'm like you and skim reviews if I haven't read the book and plan to anyway. Easier to read reviews on books that I haven't made up my mind on yet. The character loss is really sad but realistic. Guess there isn't a HEA for everyone. Elie only the one spoiler though. Very cool that you get to see Kim and get books SIGNED! Jackie it might not be who you think it is if you didn't read the quote. The previous hints are a bit of misdirection. Rebecca I look forward to your take on this book once you've read it. We can exchange condolences on the loss of ******** Yeah I saw that freebie and plan to include it in my weekend report. Everyone that read UF should own a copy. It's a great idea. Give away the first book, hook folks and they buy the next 7 books. Smart.